Fool me once, shame on you. Fool me… errr… twice…. errr.. umm….. He was great, wasn’t he? I suppose the irony of that statement was that there are probably very few people in the world that you could fool more times than George W. Bush. Just over a year ago I wrote a post called Economic Bloodletting in which I made a comparison between the government’s economic policy and the ancient medical practice of bloodletting, where doctors would try to cure an illness with a treatment that made the patient worse. Each time the patient had a a few glugs of blood removed their condition would deteriorate and in response the doctors would prescribe more bloodletting. Fortunately our health service has moved on a lot since those days but what of the other side of that comparison? How has the government’s austerity policy served us over the twelve months since I wrote that? Do I have egg all over my face now? Have I been shown to be a scaremongering charlatan? 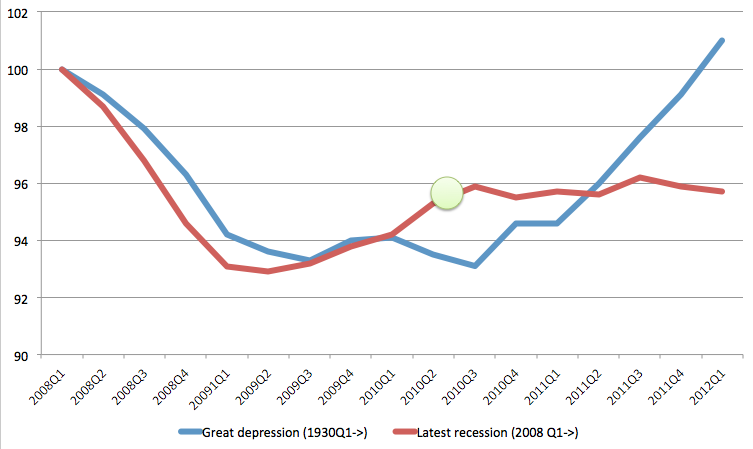 Let’s find out by updating the Depression Tacker! 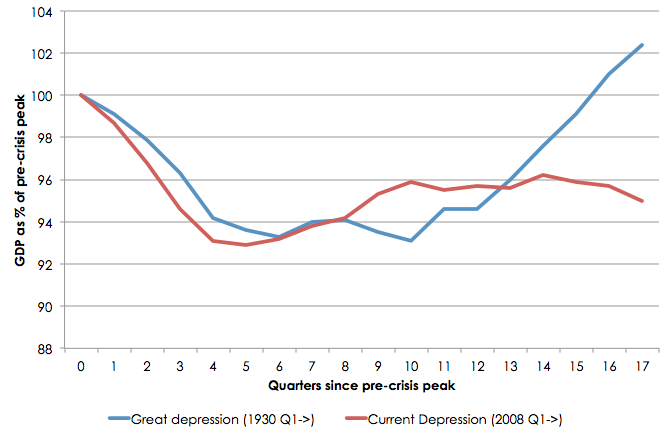 For those of your unfamiliar with the Depression Tracker – I am comparing the current UK depression with the one from the Great Depression of the 1930s (until recently the benchmark for economic catastrophes). What’s worth noting is the position of the blue diamond on the graph. That’s when David Cameron came to power. You can see that at that time, the UK economy was doing much better than the equivalent period in the Great Depression, having never sunk as far and having been in recovery for the previous 12 months. After that point you can see that the recovery ground to a halt and in comparison, the economy during the Great Depression caught us up, passed us and kept on going. Five years after the economic collapse that started the Great Depression, the UK economy had not only recovered but was 4% larger than it was before the depression started. In comparison, our economy today is still 3.2% smaller than it was five years ago. 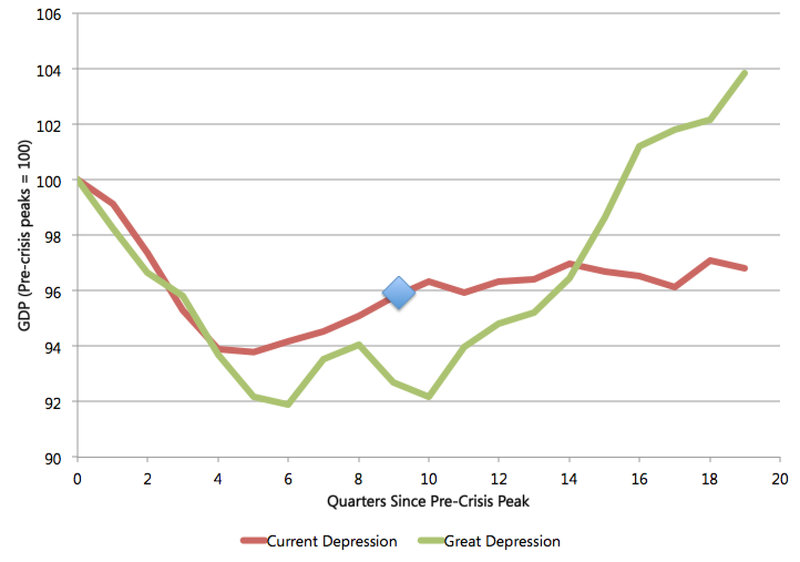 Now that’s a pretty stark difference and it’s not like I’m comparing things with a small economic hiccup – that green line is The Great Depression. So what did the government do back in the 1930s to achieve the recovery? Yep – government spending. The government built a load of houses, employing a huge number of otherwise unemployed workers in order to do so. With the prospect of war on the horizon they increased military spending and built tanks and guns and planes and things. What they spent money on back then is not really important to the comparison, (I’m not suggesting we start a world war to end the depression). The important thing was the government spent money and when the government spends money in a depression they will get an extremely good return on it in terms of economic growth. Since I wrote that post on Economic Bloodletting though, our current day government has done the opposite. They have continued to maintain their belief that decreasing spending during a depression will somehow magic up lots of growth. As you can see in the Depression Tracker above that has not happened and all they have actually achieved is the setting of a new benchmark to replace the Great Depression as the darkest point in our economic history. Last week the ONS released its quarterly report showing that the economy is shrinking again. As I’ve said before, the results of one individual quarter is not the story here. The story is the longer term picture and when we look at that we can see that our economy has basically flatlined since the current government took office almost three years ago. If the subject matter that I am discussing were something of a trivial nature then I would now be happily strutting around and saying, “I told you so!” but this subject is anything other than trivial. This failed experiment has meant a million people sitting at home waiting for work when there were no jobs for them. It has meant businesses going bust that could have otherwise continued and thrived. It has meant hundreds of thousands of students graduating into an economy that has no use for them. When you look at it like that you can understand why I would rather have been wrong. One of these days, and probably sooner than you think, those people who stuck by the government when they said austerity would mean growth are going to run out of patience. Nick Clegg and Boris Johnson have both made comments in the last week to say that we need more government spending to get a recovery. They didn’t seem to want to expand too much on why they had been directly opposing it until last week but I have a theory on that – rats leaving a sinking ship. Despite weak opposition, those who previously believed that austerity would create growth will not believe it for much longer and when this happens the government will have no choice but to do something sensible instead. Every quarter since the government came to power they have expressed solemn disappointment at the latest set of weak growth figures and sagely told us that more bloodletting is needed to cure the economy. The reason I’m optimistic is simply that I can’t see that there is any way people will continue to swallow it. Fool me once? Fool me twice? Fool me thrice? Seriously – even George W. Bush would have worked it out by now.